Download "County Administrator Our mission is to deliver quality public services to the citizens in an effective, professional and efficient manner." 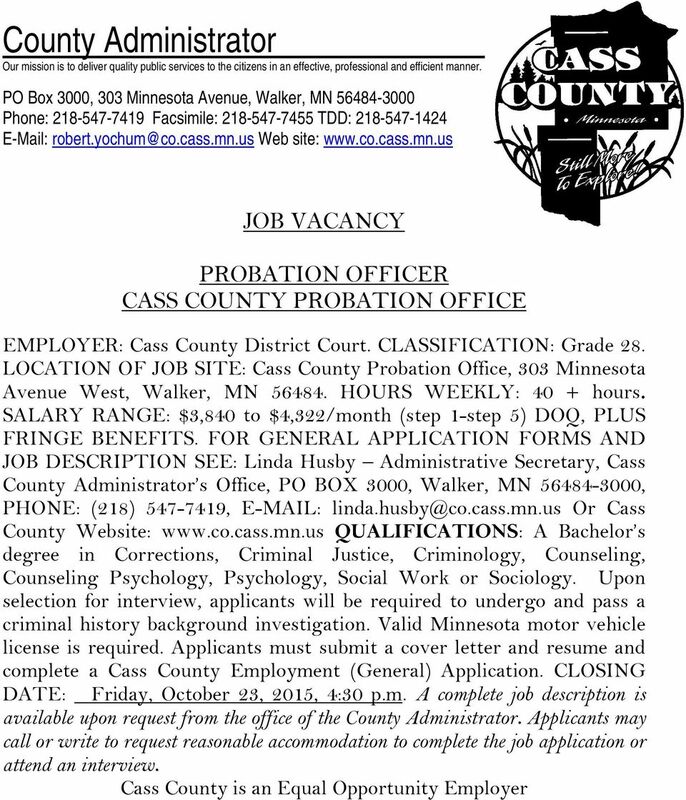 2 CASS COUNTY PROBATION OFFICER DUTIES This officer has the general powers of a peace officer for the state of Minnesota in the performance of their duties. This officer is responsible for making investigations in regard to any persons as required by the Court, supervising said persons placed on probation or of special interest to the Court, and keeping such records as the Court deems proper. This officer is responsible for ensuring parole services are offered to wards of the Commissioner of Corrections residing within the county of Cass. He or she is to ensure all orders of said Commissioner are carried out, and will provide statistical data as requested. He or she is also responsible for assisting in the development of programs which prevent delinquency and crime and which focus on keeping persons from entering the criminal justice system. Reports to: Supervises: Director of Probation Team Leader No office personnel; however, does provide some direction to interns working with this department. Dimensions: Budget: Assists Director in preparation of departmental budget. Clientele: Adult gross and misdemeanor probationers, Wellness Court and pretrial release participants, juvenile probationers and parolees, juvenile diversion and pre-diversion clients, adult and juvenile community service work clients, clients placed in a monitoring status by the Court pending the completion of Court ordered conditions. Principal Responsibilities and 1. Assist in the administrative functions of the office to ensure delivery of services and programs to staff, Court, clients and the community. A. Assist in preparation of annual budget. B. 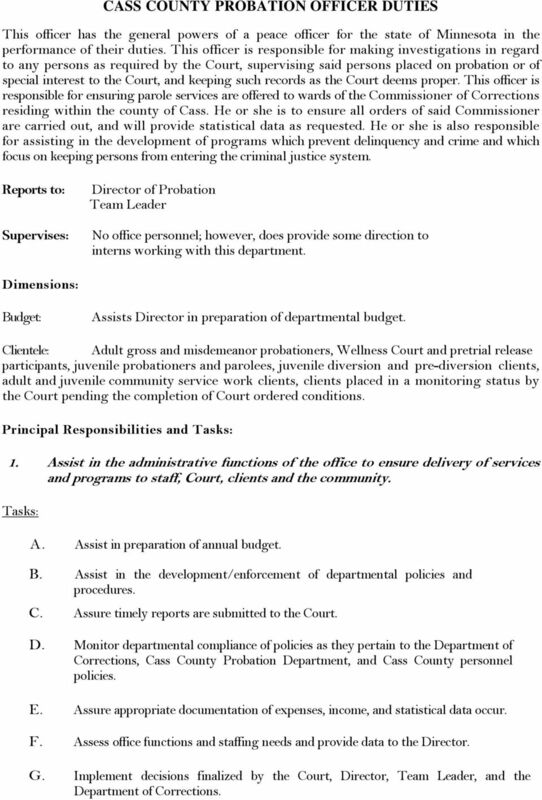 Assist in the development/enforcement of departmental policies and procedures. C. Assure timely reports are submitted to the Court. D. Monitor departmental compliance of policies as they pertain to the Department of Corrections, Cass County Probation Department, and Cass County personnel policies. E. Assure appropriate documentation of expenses, income, and statistical data occur. F. Assess office functions and staffing needs and provide data to the Director. G. Implement decisions finalized by the Court, Director, Team Leader, and the Department of Corrections. 3 H. Attend and maintain membership in the Minnesota Association of County Probation Officers and participate on panels and task forces as requested by the Director of Probation. I. Participate in staff meetings. 2. To supervise juveniles and adults who have been placed under their supervision to include contact in the community environment. A. 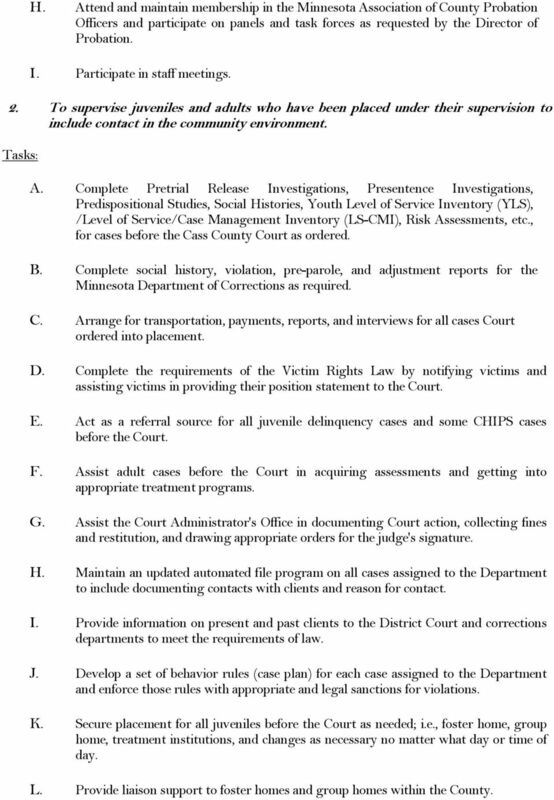 Complete Pretrial Release Investigations, Presentence Investigations, Predispositional Studies, Social Histories, Youth Level of Service Inventory (YLS), /Level of Service/Case Management Inventory (LS-CMI), Risk Assessments, etc., for cases before the Cass County Court as ordered. B. Complete social history, violation, pre-parole, and adjustment reports for the Minnesota Department of Corrections as required. C. Arrange for transportation, payments, reports, and interviews for all cases Court ordered into placement. D. Complete the requirements of the Victim Rights Law by notifying victims and assisting victims in providing their position statement to the Court. E. Act as a referral source for all juvenile delinquency cases and some CHIPS cases before the Court. F. Assist adult cases before the Court in acquiring assessments and getting into appropriate treatment programs. G. Assist the Court Administrator's Office in documenting Court action, collecting fines and restitution, and drawing appropriate orders for the judge's signature. H. Maintain an updated automated file program on all cases assigned to the Department to include documenting contacts with clients and reason for contact. I. Provide information on present and past clients to the District Court and corrections departments to meet the requirements of law. J. Develop a set of behavior rules (case plan) for each case assigned to the Department and enforce those rules with appropriate and legal sanctions for violations. K. Secure placement for all juveniles before the Court as needed; i.e., foster home, group home, treatment institutions, and changes as necessary no matter what day or time of day. L. Provide liaison support to foster homes and group homes within the County. 4 M. Provide 24-hour support to the County on all matters concerning clientele and be prepared to respond as the situation dictates. This includes adjusting lifestyle of self and family to meet this job requirement. N. Screen all cases considered for placement to be sure the requirements of current law are met. O. Represent the Department of Corrections and Cass County in all departmental hearings for youth committed to the Commissioner. This includes the presentation of the Department's case as well as the investigation of the violation. P. Represent the Department in most delinquency hearings before the Court. Q. Assist clients in acquiring employment, housing, education, etc. R. Review and know the law concerning juveniles and adults and be able to put such knowledge into a daily use when performing duties. S. Be a resource to local schools and universities for the purpose of assisting them in enforcing discipline, providing information on resources, counseling and providing information to students and teachers about the Criminal Justice System both formally and informally. T. Provide counseling service support to clients as well as spouses, parents, children, and other family members involved with the Court, or not yet before the Court. U. Establish communication; provide information and assistance in the area of plea negotiations. 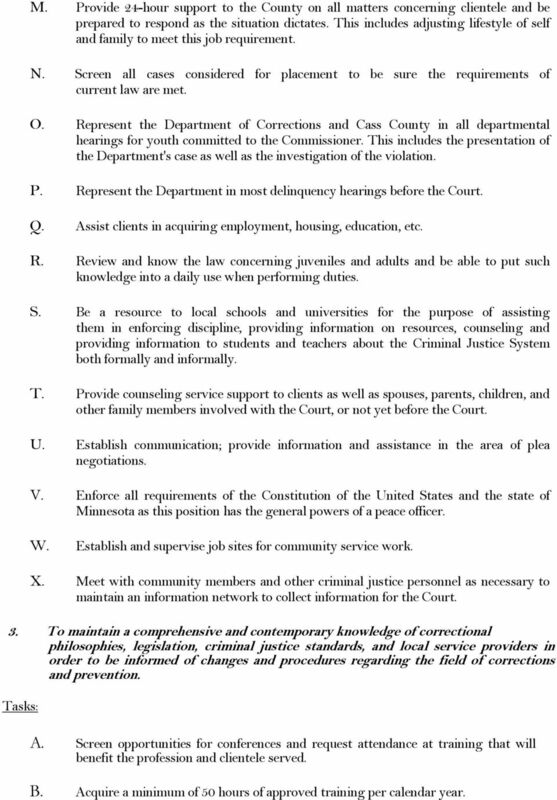 V. Enforce all requirements of the Constitution of the United States and the state of Minnesota as this position has the general powers of a peace officer. W. Establish and supervise job sites for community service work. X. Meet with community members and other criminal justice personnel as necessary to maintain an information network to collect information for the Court. 3. To maintain a comprehensive and contemporary knowledge of correctional philosophies, legislation, criminal justice standards, and local service providers in order to be informed of changes and procedures regarding the field of corrections and prevention. A. Screen opportunities for conferences and request attendance at training that will benefit the profession and clientele served. B. Acquire a minimum of 50 hours of approved training per calendar year. 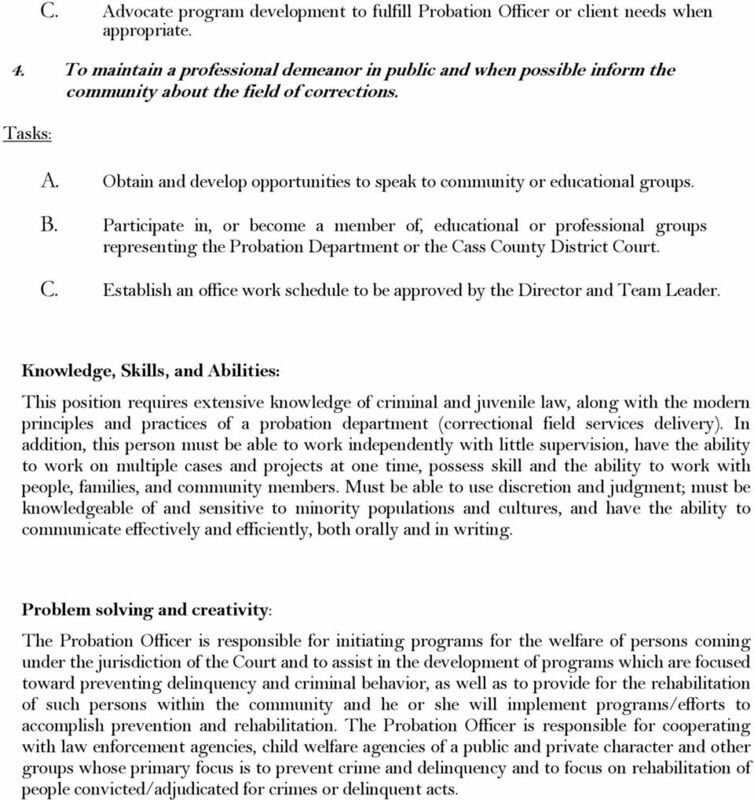 5 C. Advocate program development to fulfill Probation Officer or client needs when appropriate. 4. To maintain a professional demeanor in public and when possible inform the community about the field of corrections. A. Obtain and develop opportunities to speak to community or educational groups. B. Participate in, or become a member of, educational or professional groups representing the Probation Department or the Cass County District Court. C. Establish an office work schedule to be approved by the Director and Team Leader. Knowledge, Skills, and Abilities: This position requires extensive knowledge of criminal and juvenile law, along with the modern principles and practices of a probation department (correctional field services delivery). In addition, this person must be able to work independently with little supervision, have the ability to work on multiple cases and projects at one time, possess skill and the ability to work with people, families, and community members. Must be able to use discretion and judgment; must be knowledgeable of and sensitive to minority populations and cultures, and have the ability to communicate effectively and efficiently, both orally and in writing. Problem solving and creativity: The Probation Officer is responsible for initiating programs for the welfare of persons coming under the jurisdiction of the Court and to assist in the development of programs which are focused toward preventing delinquency and criminal behavior, as well as to provide for the rehabilitation of such persons within the community and he or she will implement programs/efforts to accomplish prevention and rehabilitation. The Probation Officer is responsible for cooperating with law enforcement agencies, child welfare agencies of a public and private character and other groups whose primary focus is to prevent crime and delinquency and to focus on rehabilitation of people convicted/adjudicated for crimes or delinquent acts. State of Florida EDUCATION FOR OFFICIAL USE ONLY POSITION APPLIED FOR GENERAL INSTRUCTIONS FOR COMPLETION OF APPLICATION: HOW DO WE CONTACT YOU?